The earliest version of cornbread was baked by Native Americans. European settlers soon saw the benefits of cultivating corn, and cornbread became a staple of the early colonial diet. 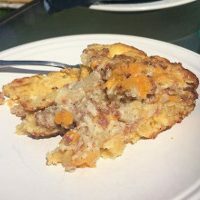 Cornbread remains common to dinner tables throughout the South, and makes its way out of many kitchens come chili or stew time. One of the luxuries of a kamado grill is the ability to use it like a wood fired brick oven. Saffire Baked Cornbread is some of the best cornbread you will ever taste. 1. Prepare Saffire for baking with heat deflector (see your Saffire manual). 2. Preheat Saffire to 450 degrees. Add wood chips as you begin to bake the cornbread. hint of smoke; don’t overdo it. 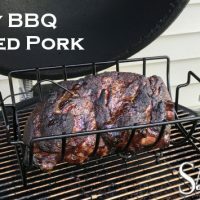 Smoke for half the cooking time or to taste. on the grill for a few minutes until it’s sizzling. 4. Mix the dry ingredients together; set aside. 5. Mix the egg and milk together. about 10 minutes. This will create a lighter cornbread. 7. Take the cast-iron skillet off the grill .It should be smoking hot, but be careful not to burn. done, the cornbread should be golden smoky brown. You can test for doneness with a toothpick. Consider serving the cornbread with a honey-whipped butter. Simply soften some butter and mix in some honey.